Leith-Built Ships is a testimony to the skill of the men who built the ships and to the many men and women who may have sailed or served on them. This history is brought together in vol. 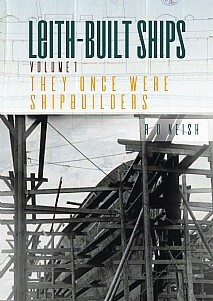 I of a three-volume series about the almost-forgotten part that Leith played in our great maritime heritage and is the culmination of the author’s lifetime experience of shipbuilding. Most people may well be aware of the part played by the great shipbuilding centres in the UK’s history but many may be unaware of the part played by the shipbuilders of Leith. This port was once Scotland’s main port with many firsts to its name. Leith had begun building ships some 400 years before the great shipyards of the Clyde and these vessels reached all corners of the globe, touching many people’s lives. Some had sad histories while others took part in some of the great conflicts of the times; many were just ordinary working vessels that carried their crew safely through long working lives. With a pedigree of shipbuilding second to none going back over 660 years of recorded history, the ships built at Leith deserve their place in history and this book begins the story. This will be of great appeal to anyone interested in ships and shipbuilding along with the maritime heritage of the UK. Simon J. Hall HARD DOWN! HARD DOWN!